Microsoft Research today quietly launched its social network Socl on Android, iOS, and Windows Phone. You can download the new apps now directly from Google Play, Apple’s App Store, and the Windows Phone Store. Socl was first created purely as a research project, but Microsoft has been adding features to it and tweaking it for years. Now the social experiment has finally been ported from desktop to mobile, as first spotted by WMPoweruser. Create visual responses (“riffs”) to existing content. 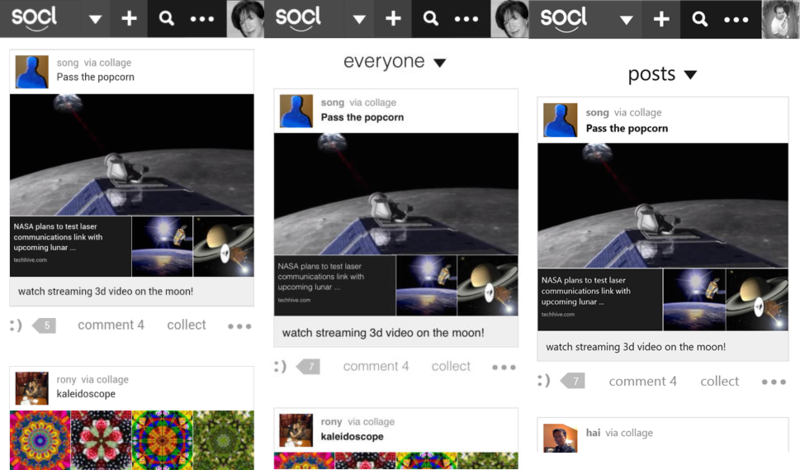 For those who have never heard of it, Socl (pronounced simply “social”) lets you create, collect, and share content from rich visual collages to short animated media and memes. Content can be aggregated directly on Socl, as well as on Facebook, Pinterest, Tumblr, and Twitter. At any given time, the Socl site mainly shows content from Microsoft employees. Clearly the team is hoping that by launching mobile apps, it can finally expand its test to a broader audience; so far, Socl is fun to play around with, but few users actually stick around for long.